of color graphic systems on a standard PC running Microsoft Windows 10/7/Vista/XP/2000 operating system. The standard TESSELATOR symbol libraries is used to achieve the same "look and feel" as the original TESSELATOR 7000 system. All existing TESSELATOR compatible keyboards and trackballs could be used as input devices. Display Edit: Supports all the TESSELATOR 7000 "offline" display editing functionality using standard TESSELATOR keyboards. Graphic Objects: Graphic objects such as points, lines, rectangles, arc, circle segments etc. can be displayed together with the alphanumeric and graphic symbols on the TessEm7000 screen. 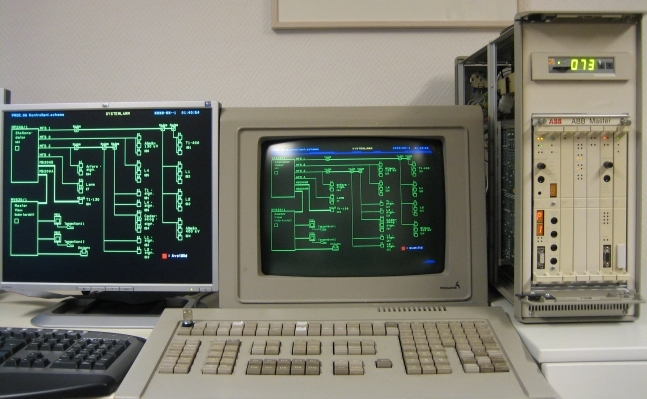 The product TessEm7000 can directly be used together with host computers such as ABB MasterView 810/830, ABB DMS, ABB SuperView, ABB ALSY 225, ABB AccuRay 1190, ABB Transmission HVDC CAS, LinkLaser Process Supervisor or other systems using TESSELATOR 7000 products as graphic operator interface. The TessEm7000 can also replace a TESSELATOR 8100 system using asynchronous communication with the host computer! TessEm7000 - Improvements versus TESSELATOR 7000! TessEm7000 - Differences from TESSELATOR 7000! TessEm7000 - TESSELATOR 7000 Performance comparison! TessEm7000 - New features under development! For detailed description of the additional options, general technical data and requirements, see the TessEm7000 data sheet.